U.S. stocks retreated, with the S&P 500 Index falling the most in three weeks, amid caution over tepid global growth and a series of looming events with the potential to spur renewed market turbulence. Losses intensified in afternoon trading following fresh poll results favoring an exit in Britain’s European Union referendum, though a rebound in the final minutes pared declines. Energy producers led the slide, capping their worst session in five weeks. Banks sold off for a second day as Treasury yields continued to drop, with Citigroup Inc. and Bank of America Corp. sinking more than 2.4 percent. 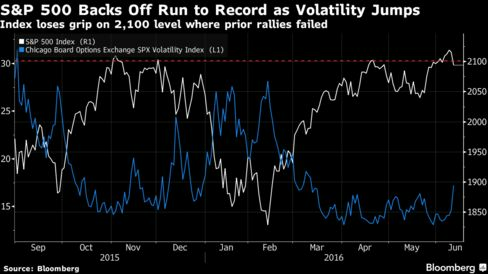 A measure of equity market volatility posted the biggest jump in five months. The S&P 500 fell 0.9 percent to 2,096.07 at 4 p.m. in New York, slipping below 2,100 for the first time in a week, a level where other rallies during the past year have faded. The Dow Jones Industrial Average dropped 119.85 points, or 0.7 percent, to 17,865.34. The Nasdaq Composite Index lost 1.3 percent, the largest decline in two months. About 6.8 billion shares traded hands on U.S. exchanges, 3 percent below the three-month average. The CBOE Volatility Index surged 16 percent to 17.03, the biggest climb since January to a three-month high. The measure of market turbulence known as the VIX also marked its largest weekly advance in five months, up 26 percent. A flight from risk was apparent as 10-Year U.S. Treasury yields fell for a fourth day to a three-year low. Friday’s retreat wiped out the S&P 500’s weekly gain, leaving the index 0.2 percent lower for the period after reaching on Wednesday its highest in nearly 11 months and coming within 0.6 percent of a record. It signals a shift in sentiment as investors reevaluate a rally that regained momentum in the last three weeks and now faces simmering concerns over the health of the economy, lackluster corporate profits and the effectiveness of central-bank stimulus. The so-called FANG stocks were the biggest drivers of the Nasdaq Composite’s worst decline since April 7, with Facebook Inc., Amazon.com Inc. and Google parent Alphabet Inc. losing more than 1.3 percent. Netflix Inc. sank 3.4 percent. Optimism that borrowing costs will remain lower for longer amid modest global growth is waning ahead of a string events in the next two weeks. The Federal Reserve and Bank of Japan meetings next week, followed by the vote on Britain’s EU membership, have the potential to roil markets. Remarks on Monday by Federal Reserve Chair Janet Yellen had soothed investors following a disappointing jobs report, as she said the U.S. economy is making progress and indicated policy makers won’t rush to raise interest rates. The employment report prompted traders to cut back the probability for a June rate increase to zero, and only 18 percent in July. At least even odds for a raise fluctuated today between December and January. A report today showed confidence among American consumers in June eased from an almost one-year high as favorable views about personal finances were offset by concerns about the economy’s prospects. A rebound of as much as 16 percent from the February low brought the valuation of S&P 500 companies to about 17 times estimated earnings, almost 10 percent more than the multiple for MSCI All-Country World Index members. Meanwhile, the U.S. benchmark’s recent approach toward the all-time high has been grinding. Before today, it failed to move more than 0.5 percent up or down for 10 consecutive sessions, the longest such streak since September 2014. In Friday’s trading, eight of the S&P 500’s 10 main industries declined, with half the groups losing at least 1 percent. Phone companies rallied for a second day amid investors’ preference for more defensive stocks, while consumer staples were little changed. Lenders posted the worst two days in five weeks. Wells Fargo & Co. and JPMorgan Chase & Co. slipped at least 1.4 percent. Along with banks, insurers fell for a second day to weigh on financials. American International Group Inc., Prudential Financial Inc. and MetLife Inc. all lost more than 1.5 percent. It’s the first two-day slide for the benchmark’s insurers since May 4. Energy producers dropped for a third day, sinking 2 percent amid the longest losing streak in two months. West Texas Intermediate crude fell 3 percent, below $50 a barrel, as the dollar gained for a second session. ConocoPhillips and Apache Corp. lost more than 4.1 percent, the steepest for both in more than two months. The health-care group was dragged lower by the riskiest part of the industry — biotechnology companies. Celgene Corp. slumped 3 percent, the most in a month, while Gilead Sciences Inc. and Biogen Inc. lost more than 1.5 percent. The Nasdaq Biotechnology Index dropped 2.2 percent. Phone companies, the group with the highest dividend yield in the S&P 500, rose 0.8 percent. Verizon Communications Inc. gained 1.4 percent to a two-month high, and AT&T Inc. increased to the highest since May 2008. Among companies moving on corporate news, H&R Block Inc. soared almost 13 percent, the best gain in seven years, after reporting better-than-estimated revenue and boosting its quarterly dividend by 10 percent. Axiall Corp. surged 26 percent after Westlake Chemical Corp. agreed to acquire the vinyl maker for about $2.4 billion to become the second largest North American producer of vinyl products used in pipe, siding and decks. Westlake added 3 percent. Mattress Firm Holding Corp. lost 12 percent after cutting its annual forecast, renewing concerns about a slowdown at the bedding provider. Tempur Sealy International Inc. declined 3 percent. Urban Outfitters Inc. fell for a sixth day, tumbling 5.8 percent after a warning on sales this quarter renewed concerns about a slowdown at the retail chain. Other retailers were also weak, with Nordstrom Inc. and Kohl’s Corp. sliding 1.7 percent.